Line a baking sheet with parchment paper (or lightly cover with flour). Bake for 12-15 minutes, until crust is golden brown. Marilyn Monroe was a film star, model and internationally-renowned glamour queen. The world was, and still is, in love with her fun, flirtatious and mesmerizing charm. If you're a Marilyn Monroe fan, then there's no doubt you're anxiously awaiting the new bio-pic, My Week with Marilyn, starring the lovely Michelle Williams. But did you also know that she was Castroville, California’s 1947 Miss California Artichoke Queen? That’s right. The infamous Sugar Kane of Some Like it Hot was the ruler of California artichokes before she ruled the California film industry. 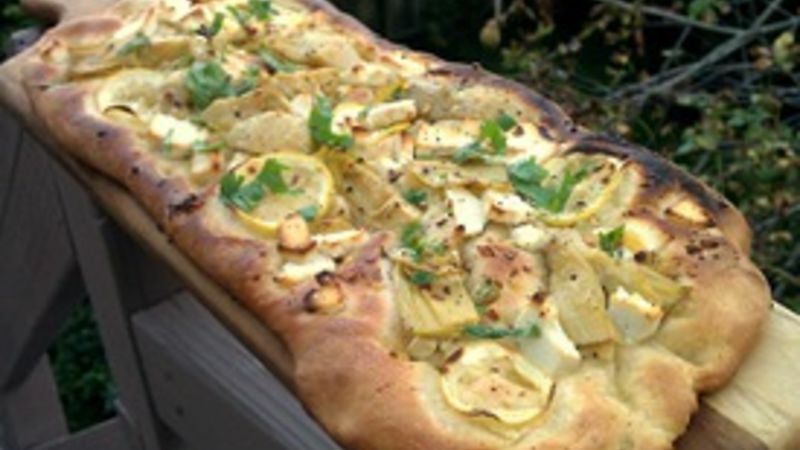 To celebrate her "rise" to stardom, I thought this savory and hearty-yet-delicate Artichoke Flatbread with Garlic and Lemon Recipe would make a fine homage to Marilyn. Start out with a good dough like this Pizza Dough Recipe from Gold Medal Flour. Preheat oven to 475 degrees F. Line a baking sheet with parchment paper (or lightly cover with flour). On a lightly-floured surface, roll dough into a 14" oblong shape. Brush dough with olive oil. Scatter dough evenly with artichoke hearts, garlic, cheese, lemon slices, salt and pepper. Bake for 12-15 minutes, until crust is golden brown. Garnish with parsley or basil.